Nonprofit Asset Management is a timely guide for managing endowment, foundation, and other nonprofit assets. Taking you through each phase of the process to create an elegant and simple framework for the prudent oversight of assets, this book covers setting investment objectives; investment policy; asset allocation strategies; investment manager selection; alternative asset classes; and how to establish an effective oversight system to ensure the program stays on track. 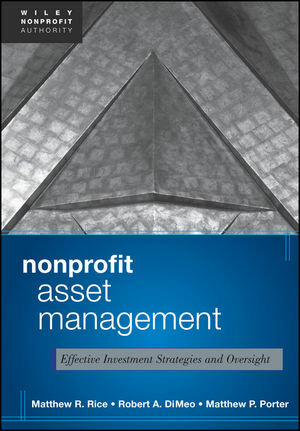 Created as a practical guide for fiduciaries of nonprofit funds—board members and internal business managers—Nonprofit Asset Management is a much-needed, step-by-step guide to the effective investment management of nonprofit assets. MATTHEW R. RICE, CFA, CAIA®, is Chief Investment Officer and a Principal at DiMeo Schneider & Associates, LLC, a Chicago-based investment consulting firm that oversees more than $35 billion in institutional and high-net-worth investment assets. He is a coauthor of The Practical Guide to Managing Nonprofit Assets (Wiley). ROBERT A. DiMEO, CIMA®, CFP®, is the Managing Director and cofounder of DiMeo Schneider & Associates, LLC. He has been featured in prominent publications such as the Los Angeles Times, Crain's Chicago Business, and Pensions & Investments and is coauthor of numerous books, including The Practical Guide to Managing Nonprofit Assets (Wiley). MATTHEW P. PORTER, CIMA®, is Director of Research Analytics and a Principal at DiMeo Schneider & Associates, LLC. He has served as consultant to a number of nonprofit and corporate clients and is coauthor of The Practical Guide to Managing Nonprofit Assets (Wiley).